What a difference a set of rules can make to the experience of a game! 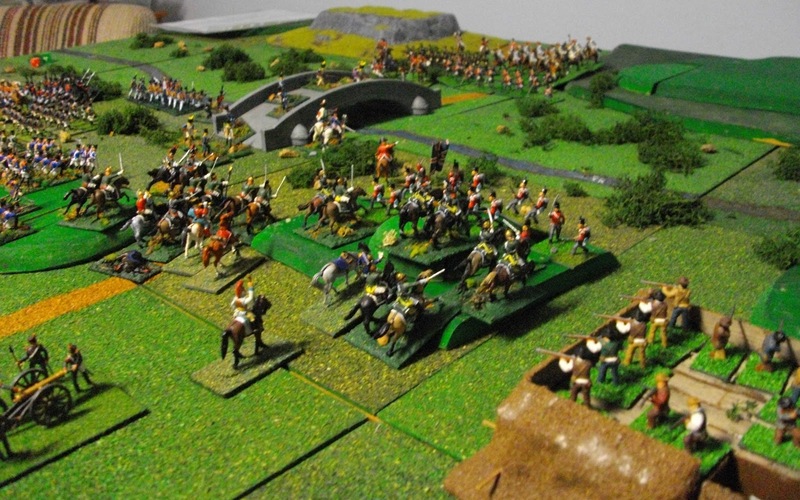 We first played this scenario using a set of rules called Grand Battery. 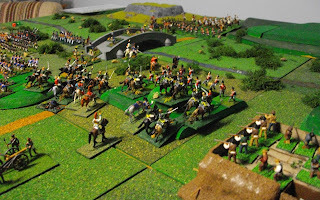 This lead to a game, that, while a bit of fun in itself, did not bear any resemblance to what we consider to be a representation of a Napoleonic battle; based on our collective 100+ years in the hobby! For our second attempt at this game we used the Shako II rules, with its growing list of ANF amendments. Not only did it have more of the "feel" of a Napoleonic wargame, it was a more closely-fought and engaging contest and played out similarly to the real thing—in so many ways. 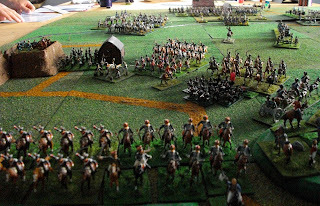 The situation, battlefield and armies are provided in the first report of this action on our blog, but the map has been reproduced below. Refreshingly, the game was instantly more sensible, with the British piquets forced back by the advance of Lamotte's cavalry. 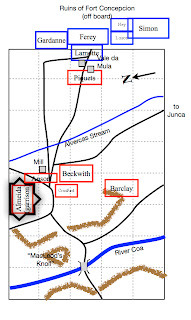 By the second turn the French cavalry had reached their initial objective of the Alvercas Stream, where they awaited new orders. Both commanders issued new orders. 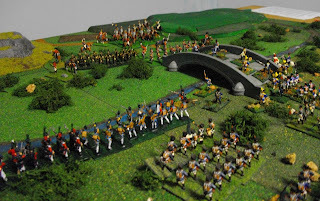 Craufurd began his withdrawal with Barclay's brigade ordered over the river first, followed by Anson's cavalry. Ney ordered a full attack. His orders were slow in being dispatched so that, while Simon and Lamotte received theirs, the aide sent to Gardanne was slow in reaching him and the one sent to Ferey was killed by a stray bullet! 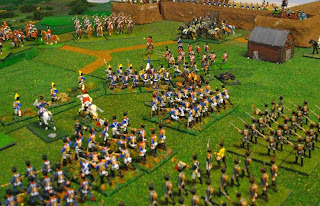 Beckwith's infantry formed square in readiness for the French attack. 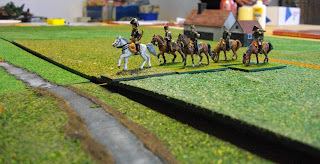 Lamotte's chasseurs charged the 43rd Foot in square, breaking in the process. 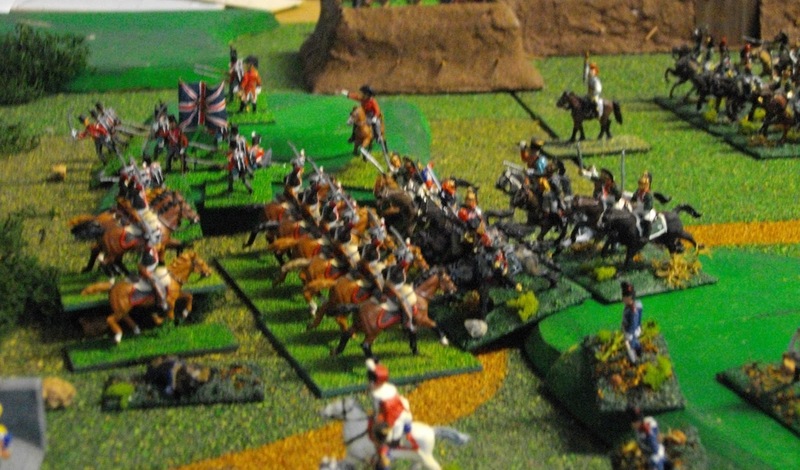 The 3rd Hussars in turn charged Beckwith's caçadores, also in square, and they too broke. Not surprisingly, this resulted in Lamotte's brigade being demoralised. Gardanne sent his 15th Dragoons against the square of the 95th rifles. 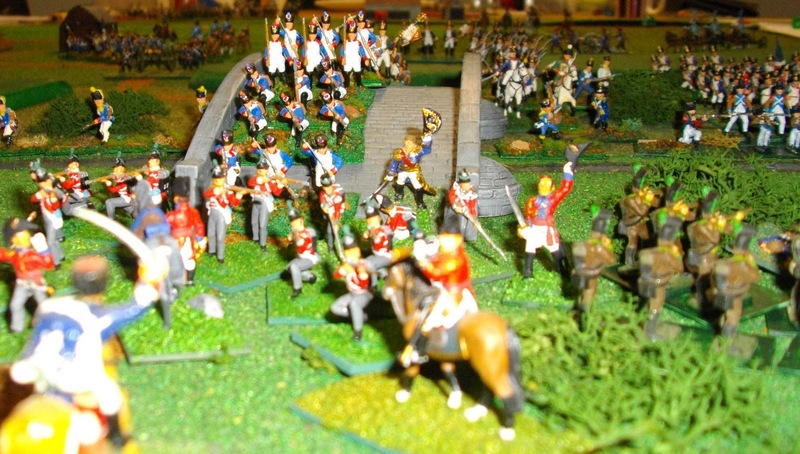 They were worsted in the encounter, but not broken, rallying behind the remainder of the brigade. Lamotte's horse battery was destroyed by the combined fire from the Portuguese heavy battery in Almeida and Ross' RHA. 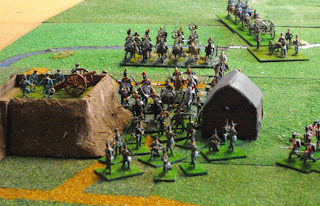 The French batteries in turn fired on Beckwith's squares and inflicted heavy casualties. Undeterred by the experience of the 15th, Gardanne sent the 25th Dragoons against the square of 95th Rifles, which had been weakened and disordered by the artillery fire. This time the punt paid off and the cavalrymen were successful! 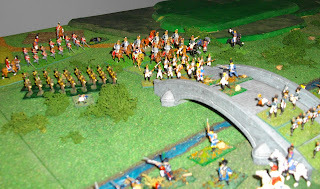 Leading the advance of the French infantry, the Chasseurs du siege of the advance guard took heavy losses from combined fire from Portuguese heavy battery and Ross' RHA. 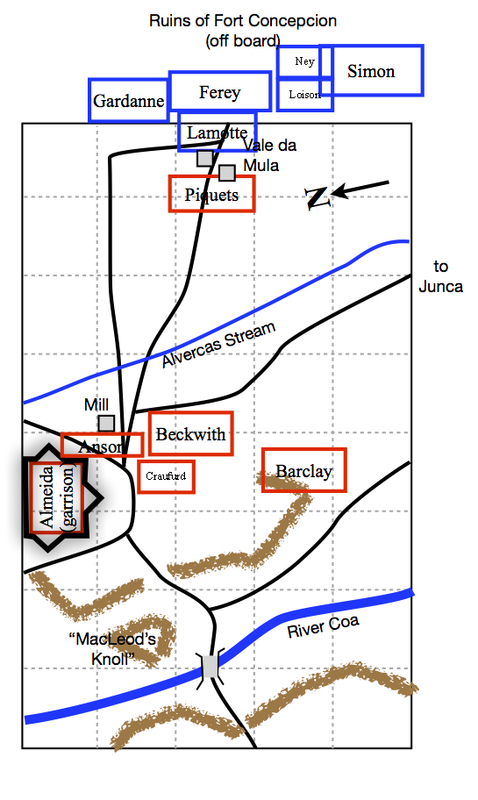 In contrast, the French artillery failed to damage Beckwith's remaining squares (caçadores and 43rd Foot). 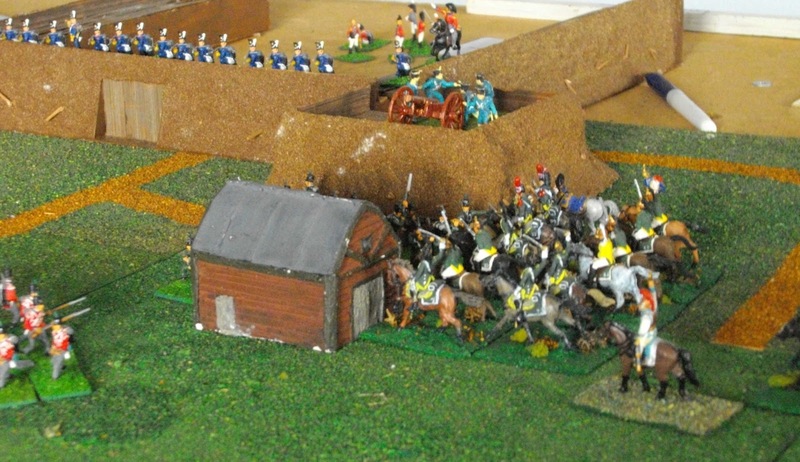 However, Beckwith's caçadores took casualties from skirmisher fire, which was sufficient to break the unit. 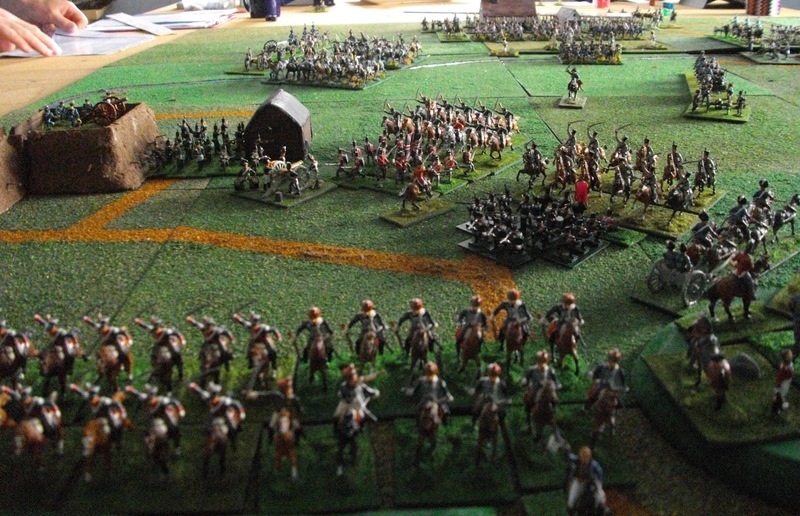 Seeing their opportunity, the Chasseurs du siege charged Ross' battery and broke it. Miraculously, Beckwith's brigade passed its 'divisional' morale. So the 43rd fought on. The square of the 43rd Light Infantry was broken by a charge of the Chasseurs du siege and retreated to the Côa. 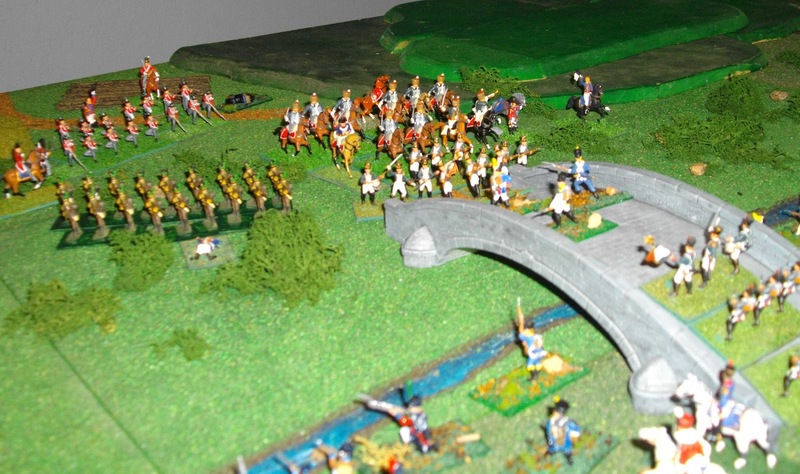 Anson's 16th Light Dragoons were forced back by a charge of the 15th Dragoons, but rallied in front of the Côa. The remainder of the Light Division continued its retirement to the bridge over the Côa. The French advancing on their heels. 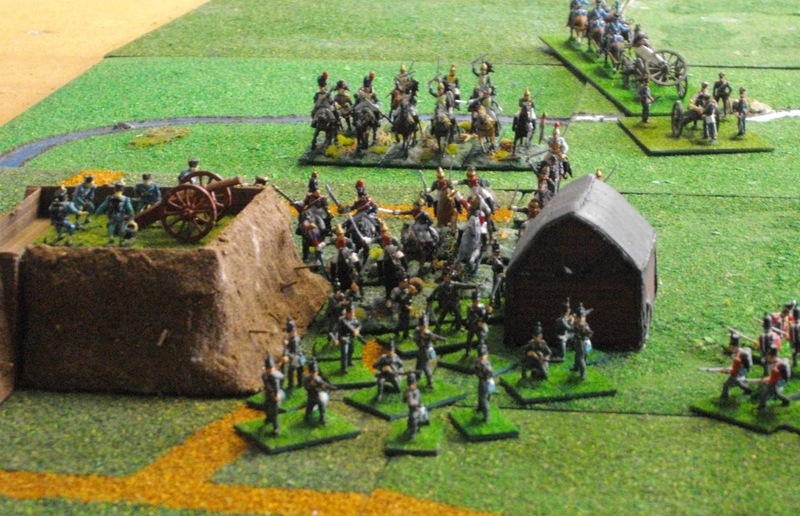 Photo 9: Having dispensed with Ross’ battery RHA, the chasseurs du siege followed up and broke the square of the 43rd (centre). Ferey’s brigade is advancing in strength in the foreground. 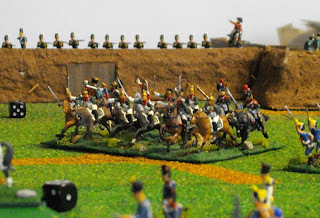 While the Portuguese heavy battery in Almeida continued to inflict casualties on the advancing French infantry, the French 25th Dragoons charged and broke the 16th Light Dragoons. Beckwith successfully rallied the 43rd Foot which took up a position on MacLeod's knoll. The fire from the Portuguese heavy battery continued, this time firing down the flank of the French columns, inflicting heavy casualties. 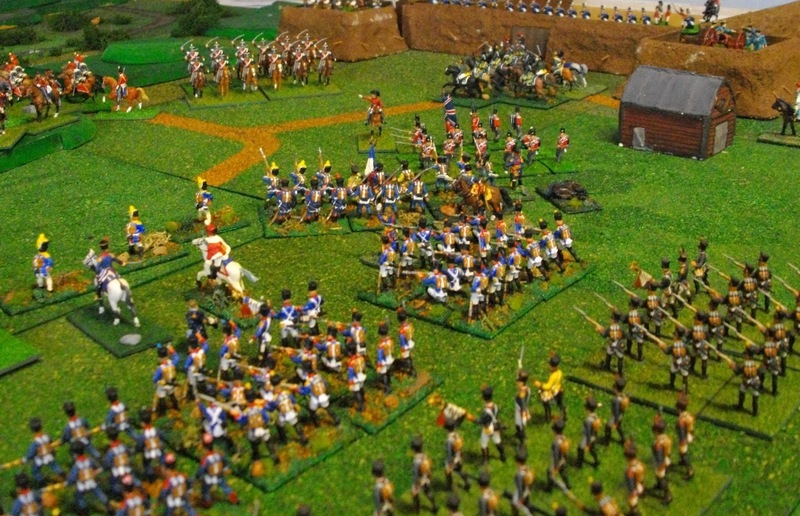 The 15th Dragoons charged the 43rd Foot on MacLeod's knoll, but were beaten back, causing Gardanne's brigade to retreat. 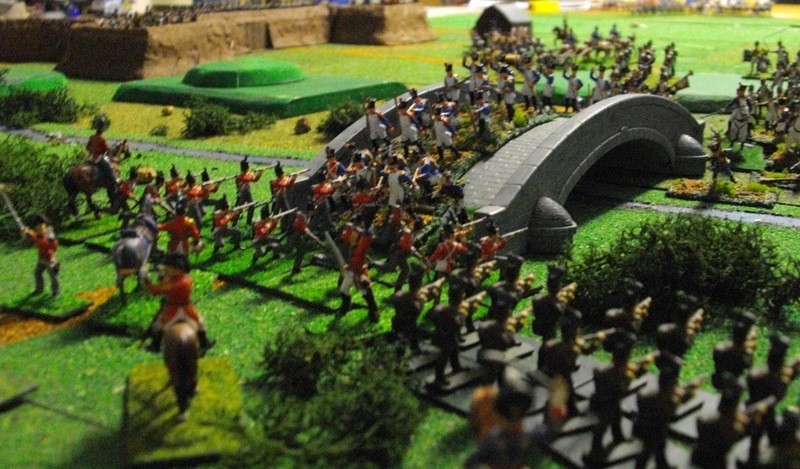 Ferey's foot artillery then fired at the 43rd, causing sufficient casualties to break the unit. Beckwith's entire brigade had now ceased to exist as an effective fighting force. 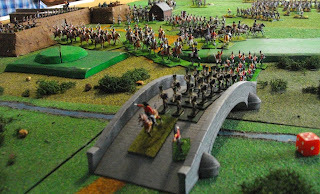 As French troops began to move over bridge, lead by skirmishers, Barclay's brigade formed a defensive line to contest the crossing. The Portuguese battery changed targets and fired at Ferey's foot guns, but for once failed to inflict any damage. 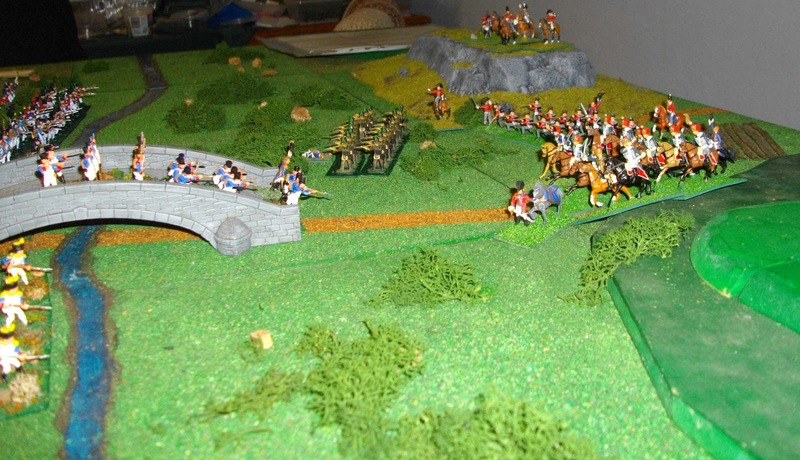 Defending the bridge, the 52nd Foot fired a volley and dispersed Ferey's skirmishers. Learning from the folly of their change of target, the Portuguese heavy guns returned to firing on Ferey's infantry, inflicting further casualties on them! Barclay's 52nd Foot successfully defended the bridge against the attack of the first unit of Ferey's brigade, the 4/66e ligne, who also lost a staff officer killed by their devastating volley. The penultimate turn of the game was a dramatic one. The 52nd suffered losses from artillery and delivered an ineffective volley against the attacking 5/66e ligne, so were pushed back in mêlée. 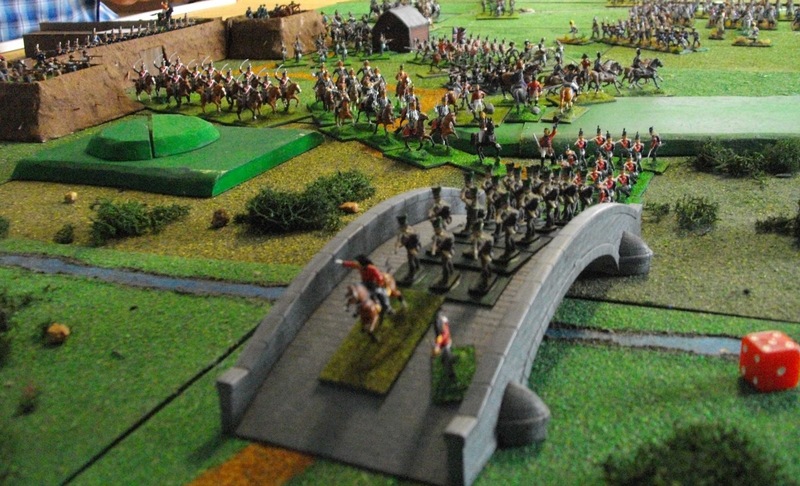 While the 52nd rallied and formed a new line further down road, this opened up the bridge to a French crossing. The French were buoyed further as Gardanne's brigade of dragoons rallied. 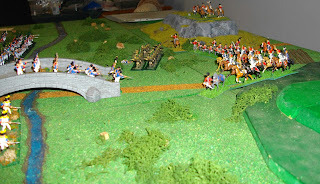 The 5/66e and 6/66e ligne lead the advance of Ferey's brigade over the bridge. Timing it perfectly, Craufurd sent the 1st KGL hussars against the lead French unit, the 5/66e ligne. The infantry did not have time to form square and were broken. Building on this initial success, the KGL Hussars followed up and charged the next French unit, the 6/66e ligne, which also failed to form square and was in turn broken. These losses were sufficient to cause Ferey's brigade to break. At this point Ney called off the attack. 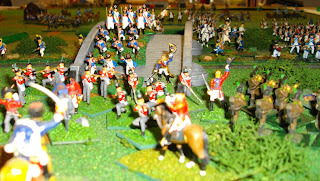 The battle was a draw by the scenario victory conditions. The Light Division had escaped by a whisker. 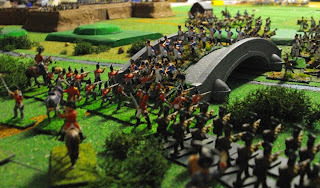 The sacrifice of Beckwith’s brigade being the price paid. The River Côa makes for an interesting and challenging game, which we highly recommend. Please feel free to utilise our scenario for this action. We think it is a particularly good game to use as a test for a new set of rules. Sounds like the game followed history in all but the details. You can't ask more than that from a set of rules! Well put Rosbif. Good rules and great scenario design :-) ! I've always wanted to do this battle and good to see someone at least did and I could read about it. I enjoyed seeing the edge of Almeida too. Looks like it was plenty of fun! Thanks for your positive comments. I think it is fantastic that we have a medium that allows like-minded/interested people across the world to so easily share information, ideas, photos and to 'discuss' topics of interest. It's just great. 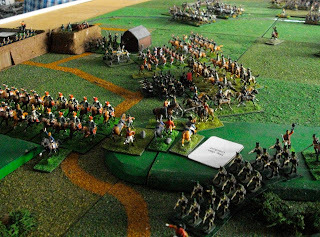 Our scenario for Côa is on google docs, freely available (the link is under the first write-up of the battle on this blog). It was designed for those terrible Grand Battery rules, but is easily adapted, as we did for Shako. Please feel free to use/edit it. 'Almedia' is a vauban-style fortress that I scratch-built for games in the French & Indian Wars. It's a bit rough, but I was happy with it. You get a larger view of the photos if you click on them--apologies if you are already aware of that!